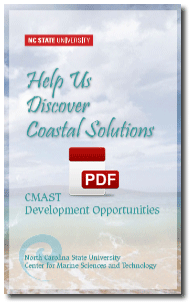 Download the PDF to explore ways you can help us Discover Coastal Solutions. Right-click to download, click to view PDF in your browser. From naming a dolphin bone for our “Skeleton Crew” project, to supporting student fellowships, to naming rights for our planned student center, there’s a wide variety of ways that friends, alumni, and those that love ocean and estuaries can support the mission at CMAST. It’s easy to choose an option that’s right for you. Gifts generally fall into one of two categories: outright gifts or planned gifts. An outright gift may be a check you write for your contribution. A planned gift could take the form of an endowment or capital project. Both options are easy, and provide funding that’s crucial in helping CMAST continue to make significant discoveries and train the next generation of scientists. If you would like to discuss a planned gift, please contact Dr. David Eggleston, CMAST Director 252.222.6301, eggleston@ncsu.edu.